“Hair is our crowning glory!” A statement that holds water in modern western society. I’m one of those women who used to spend many hours at the hairdresser having my tresses trimmed, coloured, bleached and treated to achieve a look. Then there is the maintenance of the look – shampoo & conditioner for coloured hair, mousse, gels, leave in conditioner and blow drying. I am sure this sounds so familiar to most women and maybe to some men out there. On 9th October 2010, I decided to cross to the other end of the spectrum and join what I call the elite group people – the bald people. No, I didn’t lose my marbles like Britney. Shaving my head was my way to mentally prepare for the expected hair loss as chemotherapy progress. You would have seen some of the pictures in inaugural day. I have to be truthfully honest to say that I do feel liberated being bald. When someone dons a new look, it is normal to expect some sort of reaction. Stares, pointing fingers and even giggling behind my back are just the typical reaction I receive for being a bald woman who happens to be Asian. If an adult stares at me, sometimes I stare back or make funny faces to throw them off guard. With young kids, they would either stare and pointing. I just smile back at the kids and enjoy their innocence. It is human nature to look at something or someone who pleases the eye. So this begs the question, “why do men/women look at bald women differently versus bald men?” Yes, I can hear the argument that it is more socially acceptable for a guy to be bald. When we see Hollywood celebrities like Britney Spears, Sigourney Weaver, Demi Moore or Natalie Portman shave their heads, their status is elevated for being cool and some say “they get paid to do so”. 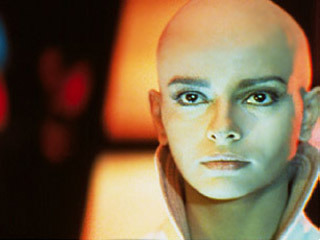 There is only one Asian celebrity whom I believe carry a bald look and yet stay beautiful is non other Persis Khambatta from Star Trek. So, why is then that women especially Asian women over react when they need to shave their heads. Ladies, “is hair a sign of beauty ?” It just hair, it will grow back. Well for the last 4 months, I haven’t had the need to pick up a hair brush or use any sort hair related products. I don’t have bad hair days ever :). I love being bald that I will keep this “Persis Khambatta” look for a while. To those women who embrace the bald look regardless of the reason, I salute you! No matter what others say you are courageous, amazing, strong and beautiful.